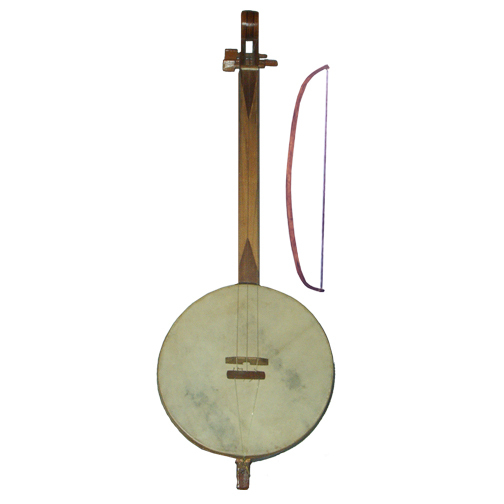 Chuniri is an ancient Georgian string instrument played by a bow-shaped stick. It consists of Chunirioval body (1), neck (3) and subsidiaries. The sound is reproduced with a bow. The body(1) of the Svanetian Chuniri has the shape of a sieve. It is open from below. It is covered with leather (2). The neck (3) is whole and flat that is attached into the body. On the head there are three holes for tuners. The subsidiaries are tuners (4), a bridge (5) and a leg (6). On one end of the neck, horsehair strings are fastened. The bow (7) has notches for strings. A Rachian Chianuri has a boat-like body, cut out of a whole piece of wood. It has 2 holes of 5-6 mm in diameter. The body is covered with leather that is fastened by a rope to the back part of the Chuniri. The neck is whole. Its round head has 2 holes for strainers. Khevsuretian and Tushetian Chianuris have round bodies. Chuniri While playing, the musician touches the strings with finger-cushions but without touching the neck, therefore the Chianuri has a flageolet sound. The bow touches all strings simultaneously so the Chianuri has only three-part consonance. The bodies of Chianuris and Chuniris are made of fir or pine-tree. The necks are of birch or oak. The strings are made from horsehair. This sort of string gives the instrument very soft and sweet sounding. 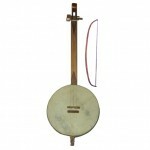 The Rachian Chianuri has 2 strings. Its tune is major third. The tune of the 3-stringed Svanetian and Tushetian Chuniri is second-third. Chuniri can have two or three strings made of horsehair. Its fiddlestick also has horsehair. Chianuri has the prop attached to the edge of the hollow body along the neck. Only the mountain inhabitants of Georgia preserved this instrument in its original form. This instrument is considered to be a national instrument of Svaneti and is thought to have spread in the other regions of Georgia from there. Chuniri has different names in different regions: in Khevsureti, Tusheti (Eastern mountainous parts) its name is Chuniri, and in Racha, Guria (western parts) – “Chianuri”. Chuniri is used for accompaniment. It is often played in an ensemble with Changi and Salamuri. Both men and women played it. One-part songs, national heroical poems and dance melodies were performed on it in Svaneti. Chuniri and Changi are often played together in an ensemble when performing polyphonic songs. More than one Chianuri at a time is not used. Chianuri is kept in a warm place. Often, especially in rainy days it was warmed in the sun or near fireplace before using, in order to emit more harmonious sounds. This fact is acknowledged in all regions where the fiddlestick instruments were spread. That is done generally because dampness and wind make a certain affect on the instrument’s resonant body and the leather that covers it. In Svaneti and Racha people even could make a weather forecast according to the sound produced by Chianuri. Weak and unclear sounds were the signs of a rainy weather. The instrument’s side strings i.e. first and third strings are tuned in quart, but the middle (second) string is tuned in tercet with other strings. It was a tradition to play Chuniri late in the evening the day before a funeral. For instance, one of the relatives (man) of a dead person would sit down in open air by the bonfire and play a sad melody. In his song (sang in a low voice) he would remember the life of the dead person and the lives of the other dead ancestors of the family. Most of the songs performed on Chianuri are connected with sad occasions. There is an expression in Svaneti that “Chianuri is for sorrow”. However, it is often used at parties as well. This entry was posted on Wednesday, February 12th, 2014 at 9:41 am	and is filed under Folk, Georgian Music, History. You can follow any responses to this entry through the RSS 2.0 feed. Both comments and pings are currently closed.